With David Pocock’s 2017 sabbatical sure to fire up the debate on what back row arrangement will replace the ‘Pooper’, I crunched some stats on win percentages associated with the different starting back row arrangements the Wallabies have used. The time period is since Pocock’s first start on June 20, 2009, to the game against England on December 3, 2016. Of course the back row combination is far from the only factor which will influence the outcome of the game, but with 112 Test matches during that period, the influence of different combinations will start to show up in the win/loss statistics. 1. David Pocock starting in a conventional back row, with a large six and eight – win percentage 68 per cent. 2. 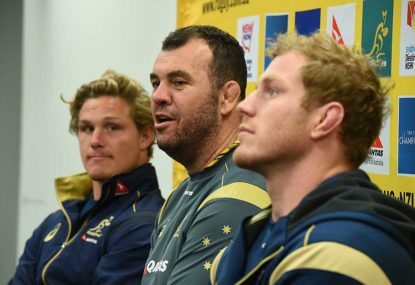 Pocock starting with Michael Hooper – win percentage 57 per cent. 3. Hooper starting in a conventional back row – win percentage 52 per cent. 4. All dual open-side combinations over the period, including George Smith and Sean McMahon – win percentage 61 per cent. Hooper appears to have substantially reduced the win percentage when he plays in a conventional back row and even the Pooper had the team at a lower win percentage than when Pocock played without him. However, Hooper’s stats paint a harsher picture than reality, with much of his period as the sole 7 during two tumultuous coaching upheavals. The team sustained a number of losses in the Rugby Championship when Ewen McKenzie took over from Robbie Deans in 2013, before finding a groove on the 2013 Spring Tour. Similarly, performance dropped badly when Michael Cheika took over at short notice from McKenzie after the Mendoza fiasco, where the Wallabies were beaten 17-21. Neither of these falls in performance could have been countered by Hooper’s individual efforts. Pocock however, played most of his games until 2012 in a conventional back row with an established team and benefited from the same coach for five seasons, a much more settled environment. I would also note that Hooper was the only 7 playing during two draws against the All Blacks in 2012 and 2014, the Wallabies being injury-depleted on both occasions, so I consider those to be worth a win. Pocock’s only draw was against Ireland in 2009. So, I have created a percentage for Hooper based on the Spring Tour 2013 plus the French tour and Rugby Championship (excluding Mendoza) in 2014. I have also counted the 2014 draw as a win for the purposes of this percentage. This period effectively covers an entire Test season, if in a slightly different order, and that it is when we best saw what Hooper could do in a conventional back row, in a functioning team environment. The percentage is 76 per cent. 1. Running dual open sides is clearly inferior to just running Pocock in a conventional back row. 2. Depending on whether you adjust Hooper’s percentage, running duel opensides somewhere between a little better and clearly inferior to running Hooper in a conventional backrow. I am in the clearly inferior camp, based on Hooper’s excellent 2013-14 season results. 3. On the question of which openside is better for the team, depending on how you treat Hooper, it ranges between Pocock being a lot better and both of them being about the same. I am in the latter camp – McMahon would do as well as either at 7 if he were to start as part of a conventional back row. The selectors need to acknowledge that if the Wallabies are to succeed, they need to end the experiment with starting dual open sides and move back to having a ‘full size’ 6 and 8, with players only big enough to be a 7 started in that position or run off the bench. With Pocock overseas, McMahon has his chance at more starts at 7 this year, without unbalancing the back row at 6 or 8.